In the second leg of this Copa Del Rey last 16 tie, Leganes played host to Real Madrid at the Butarque stadium. Madrid led 3-0 on aggregate going into the match but were unable to extend that lead as Leganes handed Santiago Solari his fourth defeat since becoming Madrid manager in a 1-0 win for the home side. 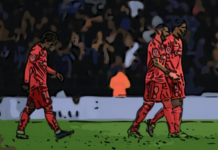 In this tactical analysis, the statistics will act as evidence for each team’s approach to this match and their successes, or lack of, on the pitch. Both teams entered this game having only lost two of their previous nine matches. However, Real Madrid would be the team considered in better form having 1 draw, compared to Leganes’ 3 in the same amount of games. And this, almost shared, form for both sides continued on paper as Real Madrid only managed 1% more possession than the home team. An out of favour Isco returned to the starting 11 accompanied by Marcelo as Real Madrid set up in a 4-2-3-1 formation. This system was led by Vinicus Junior and saw Keylor Navas start in goal. Their opponents lined up in a 5-3-2, with the, on loan, Martin Braithwaite and the 6’2” Sabin Merino as the two forwards, clearly outlining how Leganes were to approach the match. Leganes’ solid back five built the foundations for a very organised team. When defending, the five defenders adopted a flat defensive line. This then allowed the three midfielders to press and compact the space surrounding the player in possession. Take a look at the images below and note the strict shape Leganes hold and the actions of each unit. Leganes set and ready for play to resume from a throw in. Leganes pressure Real Madrid in the middle third. Even when out of balance Leganes obviously had a plan as they were quick to pressure the Real Madrid players after transition. This slows down Madrid’s momentum, stopping them from counter attacking and taking advantage of a Leganes side, who were rarely unorganised. In the image below you can see Vinicus being pressured, with the defending player’s body shape dictating where the space is. This player is then covered, creating a 1 vs. 2 in an effort to dispossess the striker. The surrounding Leganes players have blocked the two supporting passing lines, limiting Vinicus’ options. Real Madrid looked to break down Leganes’ compact defensive shape by exploiting the area on the opposite side of the pitch. 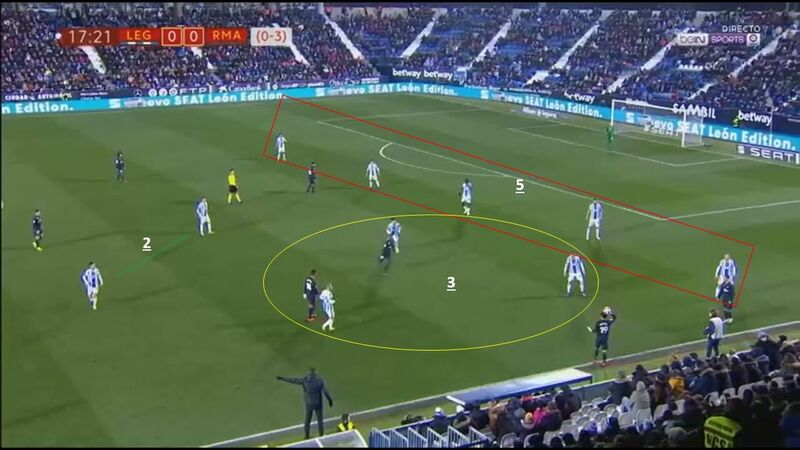 Often the Leganes players would compact the space around the ball so much that it would expose space and the opportunity for a possible 1 vs. 1 with the full back. Alvaro Odriozola and Sergio Reguilon Rodriguez maintained a wide starting position when Madrid were in possession. 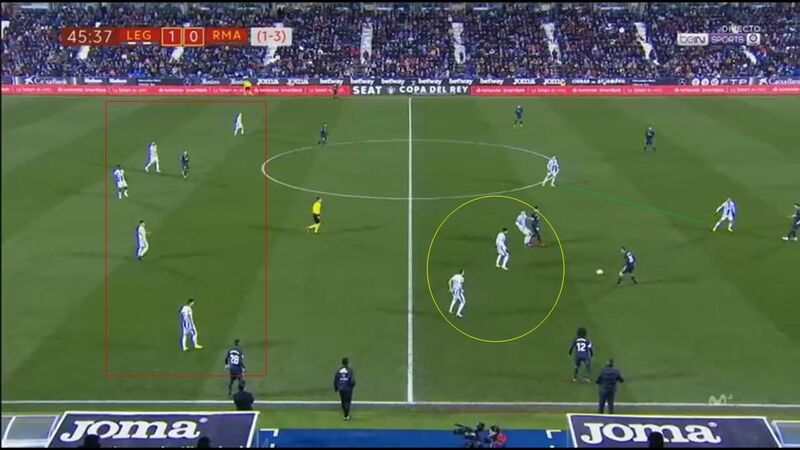 This gave the midfield players the outlet opportunity to be able to switch the ball quickly. 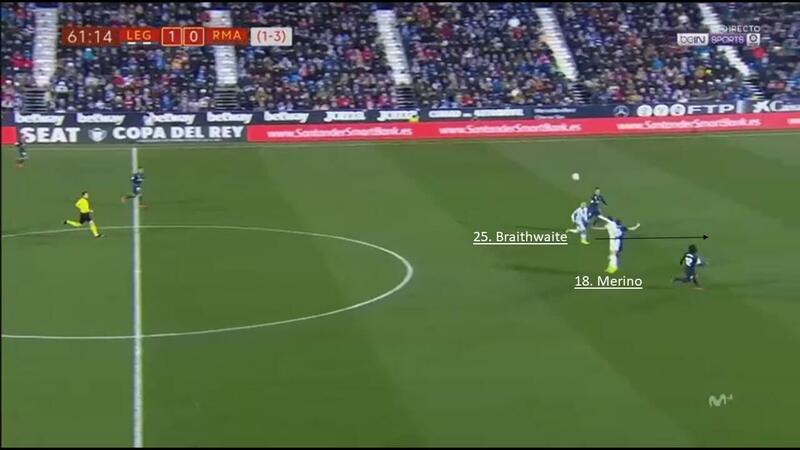 In the image below you can see Raphael Varane switching the ball to the left side of the pitch where Rodriguez position, combined with a positive first touch would allow him to advance the attack. 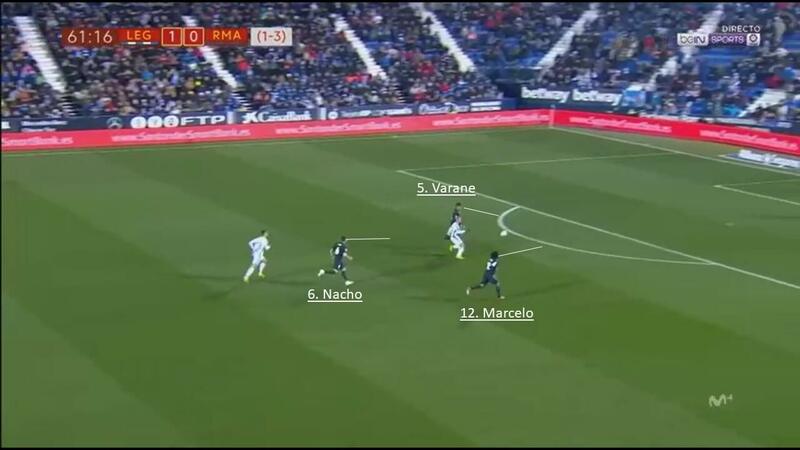 However, the Madrid outfit failed to take advantage of these moments as they were unable to move the play quickly. The Leganes team moved quickly and efficiently in each unit to set up a low block. This would force Real Madrid to recycle possession or improvise in order to penetrate and create a goal scoring opportunity. 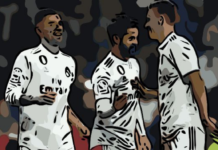 The Galactico’s best of their 11 shots came in the first half when they deployed the same tactic for Vinicus to shoot wide from within the penalty area. 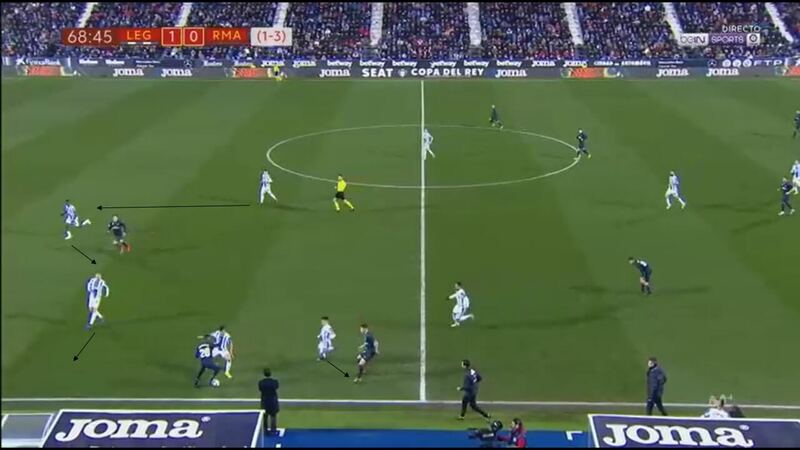 In the images below Isco starts in possession and Vinicus moves to the blind side of the defender. This then creates the opportunity to move towards the goal and a 1 vs. 1 with the goalkeeper. But, as you can see in the image above Vinicus is surrounded by four Leganes defenders, as he failed to capitalise on this possible clinical opportunity by taking too much time in possession. Leganes managed 19 shots in the duration of this match, with 31.58% on target. The home side would build up play by patiently bringing the ball forward and then pass into the forwards. Most attacks came from wide areas where Leganes completed 11 accurate crosses, one of which led to the only goal of the match. This constant onslaught led the Real Madrid centre back pairing, of Varane and Nacho, to having to make 19 headed clearances. Sabin Merino was easily responsible for a majority of the 64 aerial duels contested as he bullied the defenders. 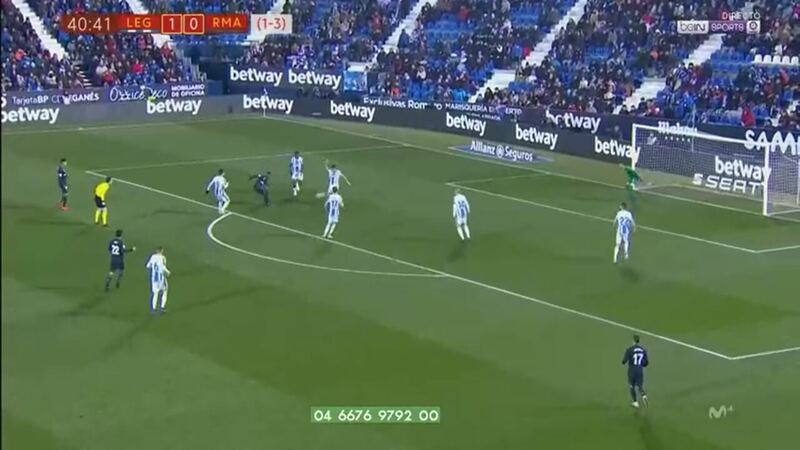 This was clearly a weakness for Real Madrid that the Leganes forwards exposed as they turned this into a defender’s worst nightmare, facing his own goal. In the image below you can see Merino challenging the aerial pass. His ability to use his physical attributes accordingly caused problems for the duration of the match. Combined with Braithwaite gambling and trying to run in behind, the Real Madrid defenders were forced to face to their own goal. This is a vital concept for attacking players as it limits the options the defender has to clear the ball, allowing the attacking team to be able to manage the ball further up the pitch. 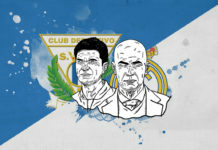 In the later stages of the match Real Madrid seemed to move into the next gear, however, they still did not manage to threaten Cuellar’s clean sheet. With them also unlikely to threaten for La Liga, it poses the question, what is ambition of this Real Madrid team? The Galacticos remain in the Champions League and, despite this loss, have progressed to the quarter-finals of the Copa Del Rey. Against a better team will Real Madrid perform in the same manner? Or should this match be scratched from all of our memories as a non-consequential loss? 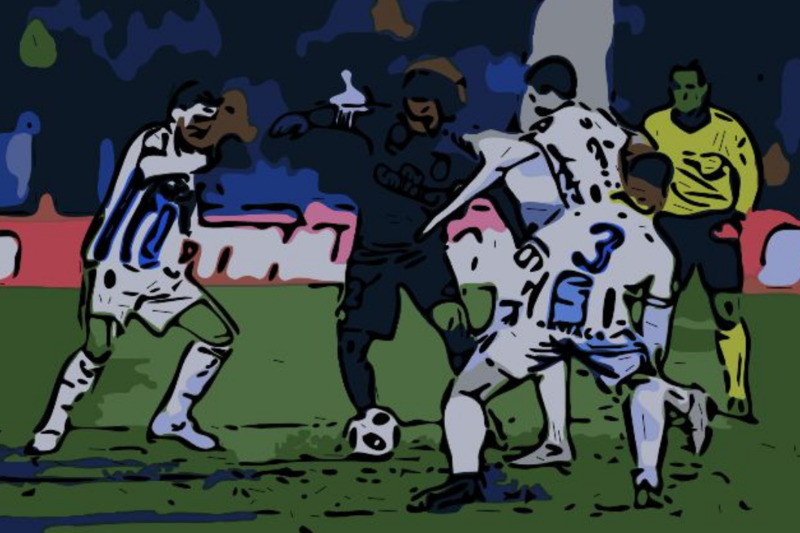 Leganes should have walked away from this match happy to have beaten the European champions, as they deployed a clearly well planned tactic that exposed problems that Real Madrid have. 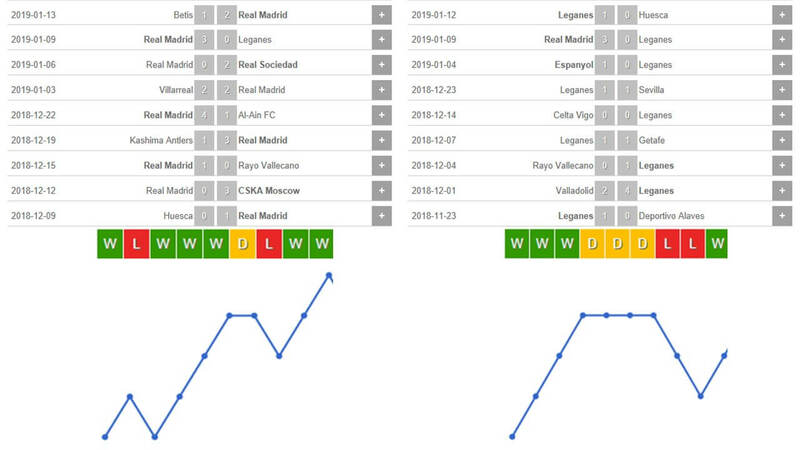 Real Madrid are not the favourites to win either cup competition, but they have surprised us all before.